Будьте в курсе кампаний и возможностей. Ваши отзывы важны для нас. Пожалуйста, поделитесь с нами, чтобы мы могли служить вам лучше. In order for our company to provide our services to our valued customers in an uninterrupted and confidential manner, it may be necessary to collect, process and transfer your personal data to third parties. Our company takes security measures at the highest possible level to protect your privacy during the collection, storage, processing and, if necessary, sharing of your personal data in accordance with law. Our aim is to inform you in the most transparent manner about the forms of gathering your personal data, the purposes of processing, the legal reasons for your processing and your rights. In accordance with the Law No. 6698 on Protection of Personal Data (Law no. 6698), your personal data will be collected and processed by MRH TURİZM OTEL BUSINESS SAN. VE TİC. AŞ. as the responsible party for data within the scope described below. Your personal data will be kept confidential and in accordance with the internal and international legislation, especially with the Social Security Institution and consumer law, complying with information obligations, storing information and documents originating from the statutory regulations, providing safe accommodation in the direction of our company principles, making necessary evaluations for the services offered, the personalities specified in Articles 5 and 6 of Law no. 6698 for the purpose of ensuring that our obligations are fulfilled, fraud is prevented, security is ensured, our market research and procurement operations are carried out, our legal processes are managed and social responsibility projects are carried out, data processing conditions and purposes. In addition to the above mentioned items, your personal data will be used in the promotion of product / service, marketing and campaign activities in order to be able to communicate with our esteemed customers regarding the products and services you receive / development of appropriate services and products, customer satisfaction studies, current or new product studies of our company and our affiliates and market research and determination of the target customer group and so on. In the framework of the contracts executed with the third party or natural persons who are in business relationship with our company, the legal and commercial obligations arising from the contract of our company are fulfilled, rights establishment, protection of rights, commercial and legal evaluation processes, legal and commercial risk analyzes, your personal data may be processed for execution. Your personal data will be transferred to the consultants and institutions that have cooperated with the partners, shareholders, affiliates, affiliated group companies and the companies in which they act as intermediaries / agencies and the services they provide as complementary or extensions of their activities to the support service organizations and other contracted organizations within the framework of the personal data processing requirements and purposes set forth in Article 8 of Law Nr. 6698 for the transfer of data and in Article 9 of the transfer of personal data abroad. In addition, the obtained data may be shared with the public institutions and organizations in case of possible disputes and with the relevant authorities for the continuation of the legal proceedings, if the public institutions and organizations have information requests fulfilled by the law in accordance with the rights and authorities granted to them. • Your preferences for your products or services, or your past experience, are collected by the responsible party for data. • This information; web sites, mobile or digital applications, social media, call centers, companies that perform activities with agency / agency title, customer interviews, SMS, written / digital applications to other web sites, support service organizations including those who receive call center services with the approval of the authorities and persons with the authority to communicate with you or through channels that may be communicated in the future, in accordance with the laws and agreements permitted by law and within the limits set forth by law. • Your personal data collected by these methods can be processed and transmitted to the purposes stated in items (b) and (c) of this Information within the scope of the personal data processing conditions and purposes stated in items 5 and 6 of Law No. 6698. • You have the right to demand that your damages be remedied if you have suffered damage due to the processing of your personal data in contravention of the law. If you submit your requests for your rights to our company by the methods described below, our company will conclude the request as soon as possible and within thirty days at the latest, free of charge. However, if the transaction also incurs a cost, we will charge the fee at the rate determined by our Company Protection Committee for Personal Data Protection. In this context, you may submit your request to use our abovementioned rights in writing or other methods to be determined by the Personal Data Protection Board in the future, in accordance with paragraph 1 of Article 13 of Law No. 6698. The channels and procedures you will submit in writing to our company within the scope of Article 11 of the Law No. 6698 in this framework are explained below. You can send your originally signed petition, which you are entitled to use to exercise your rights as set forth above together with your Identification documents to "GRANADA LUXURY BELEK HOTEL, Belek Mh. Cumhuriyet Cd. No: 7/102 P.K . 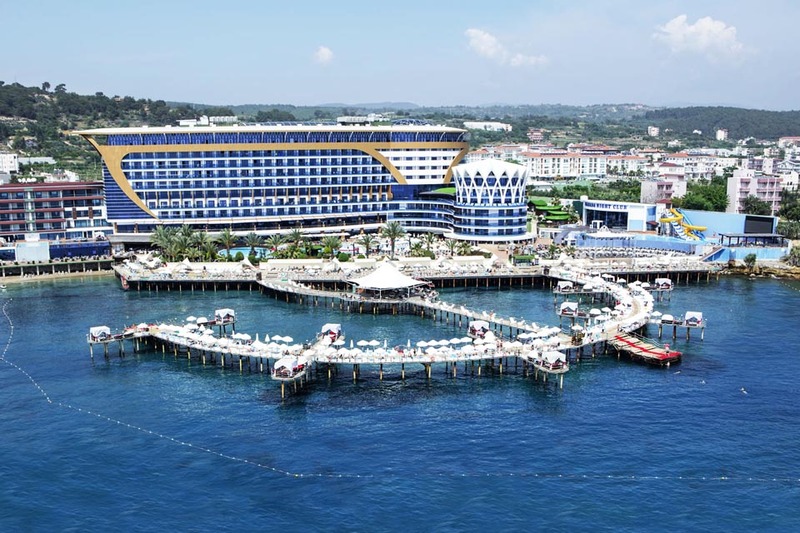 : 07506 Belek / Serik / Antalya / TURKEY" or send to info@granada.com.tr and mrh@hs05.kep.tr with secure electronic signature. We thank you for your interest and we will always be pleased to welcome you. Eşsiz güzellikler ve ayrıcalıklar ile dolu Türkiye'mizin Turizm başkenti olmaya hak kazanmış Antalya ilinin en büyük, en modern ilçesi Alanya'nın Okurcalar beldesi Alara Turizm Merkezindeyiz. Antalya havalimanına 90km, Alanya şehir merkezine 30km, Side Antik Kentine 30km mesafede konumlandık. Göz kamaştıran muhteşem mimarisi ile GRANADA, denize sıfır konumda, eşi benzeri olmayan bir iskele ile sizleri kucaklıyor. We are the premier choice for Luxury Hotel.